Ingredients: Honey, dried carrot, gluten free oat, rapeseed oil, roasted hemp seed (hemp seed, salt), roasted flaxseed, lingonberry powder (5 %), nettle (1 %). May contain traces of hazelnut, milk and gluten. FREE OF ADDITIVES, GLUTEN FREE, DAIRY FREE, SOY FREE, NO ADDED SUGAR, HIGH FIBRE. 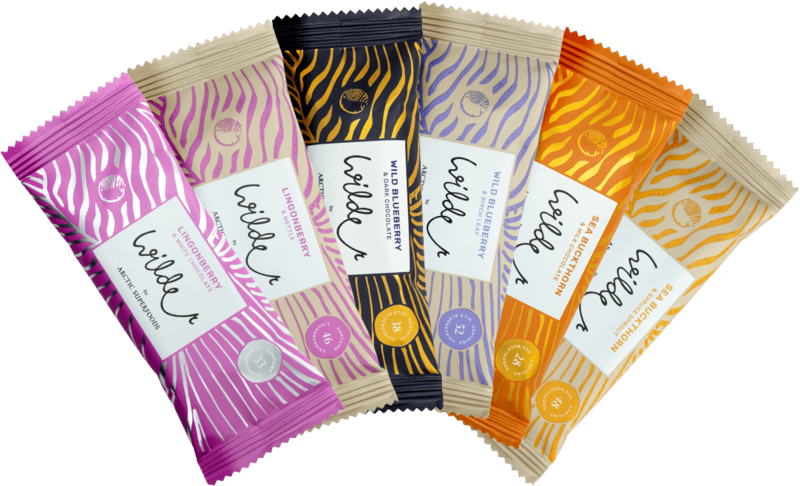 Ingredients: Dark chocolate (cocoa mass, sugar, cocoa butter, emulsifier (soya lecithin), vanilla, honey, gluten-free oats, roasted flaxseed, rapeseed oil, wild blueberry (7 %), carrot. Cocoa at least 52 %. May contain traces of hazelnut, milk and gluten. FREE OF ADDITIVES, GLUTEN AND DAIRY, NO ADDED SUGAR. Ingredients: honey, gluten free oat, rapeseed oil, dried carrot, roasted hemp seed (hemp seed, salt), roasted flaxseed, blueberry powder (7 %), birch leaf powder (0,5 %). May contain traces of hazelnut, milk and gluten. FREE OF ADDITIVES, GLUTEN FREE, DAIRY FREE, SOY FREE, NO ADDED SUGAR, HIGH FIBRE. Ingredients: honey, dried carrot, gluten free oat, rapeseed oil, roasted hemp seed (hemp seed, salt), roasted flaxseed, sea buckthorn powder (7 %), spruce sprout powder (0,8 %). May contain traces of hazelnut, milk and gluten. FREE OF ADDITIVES, GLUTEN FREE, DAIRY FREE, SOY FREE, NO ADDED SUGAR, HIGH FIBRE.